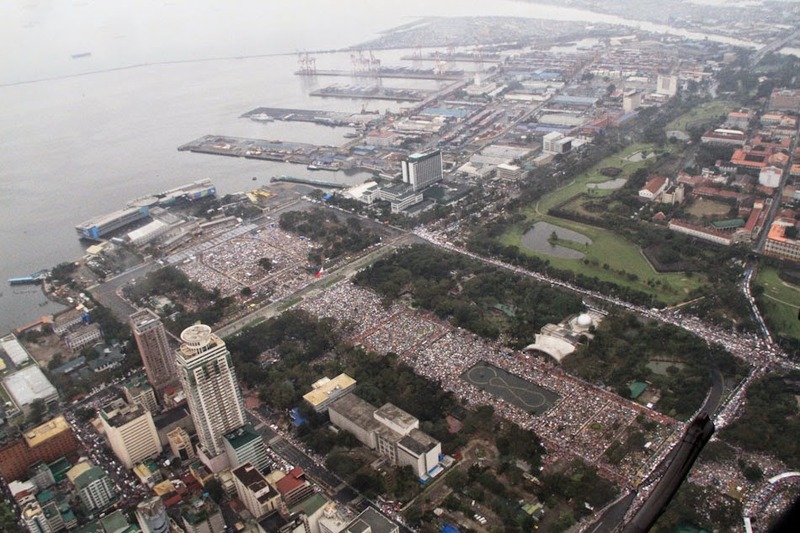 Twenty years and three days since 5 million Filipinos converged on Manila's Luneta Park for the largest event in papal history, the islands' exuberant, ever-youthful church did it again this Sunday evening – and this time around, even whipping winds and downpours from the outer bands of a tropical storm couldn't stop them. Calling it "the most fabulous number [of people] we have seen," at the press conference following this afternoon's Mass, the VatiSpox Fr Federico Lombardi SJ said local authorities had provided the day's attendance figure as 6 to 7 million. As the president of the nation's bishops, Archbishop Soc Villegas, said at the liturgy's close, Francis' "love" – and, with it, the faith of the 85 million-member Pinoy Church – had shown itself to be "typhoon-proof." Beyond taking the all-time record from the final day of John Paul II's 1995 visit in the same place, it is significant that today's mass of humanity did not come in the context of a World Youth Day, which had been the case for both the prior title-holder and Francis' draw of 3 million at the closing of 2013's WYD on Rio de Janiero's Copacabana beach. 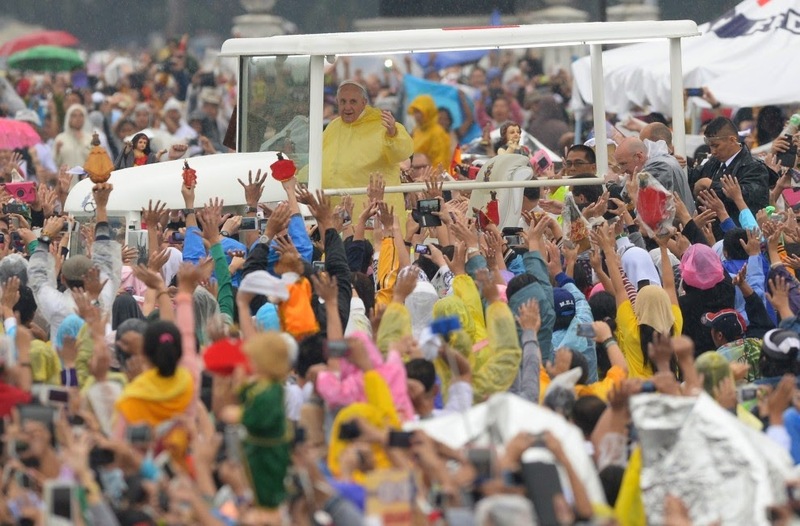 In the end, the weather – which saw Metro Manila placed under a low-level typhoon warning (and the Pope again don the same yellow poncho as the crowd) – only ratcheted up the intensity of the singing, cheering "oceanic" throng, which took to doing what was re-christened the "Francis Wave" during lulls in the long afternoon, most having been on-site or walking toward it from well before sunrise. Adding to the ecstatic yet reverent chaos, meanwhile, this Sunday was likewise the feast of the Santo Niño, the devotion to the Baby Jesus which is the most prevalent popular piety in global Catholicism's famously devout third-largest outpost, by far the premier bastion of the faith on the world's largest continent. As the faithful were encouraged to bring their statues of the Christ-child by the visit's organizers, at points it looked as if at least a million of the little Niños alone dotted the scene... or, put another way, there seemed to be almost as many statues being held up as the ubiquitous cellphones and tablets frantically trying to capture the Pope as he passed. Before the Mass, the Pope met for some 20 minutes with the father of Kristel Padasas, the 27 year-old Catholic Relief Services worker who was killed by a fallen piece of scaffolding after yesterday's emotional Mass in Tacloban amid the storm conditions there. Sometimes, when we see the troubles, difficulties and wrongs all around us, we are tempted to give up. It seems that the promises of the Gospel do not apply; they are unreal. But the Bible tells us that the great threat to God’s plan for us is, and always has been, the lie. The devil is the father of lies. Often he hides his snares behind the appearance of sophistication, the allure of being “modern”, “like everyone else”. He distracts us with the promise of ephemeral pleasures, superficial pastimes. And so we squander our God-given gifts by tinkering with gadgets; we squander our money on gambling and drink; we turn in on ourselves. We forget to remain focused on the things that really matter. We forget to remain, at heart, children of God. That is sin: [to] forget at heart that we are children of God. For children, as the Lord tells us, have their own wisdom, which is not the wisdom of the world. That is why the message of the Santo Niño is so important. He speaks powerfully to all of us. He reminds us of our deepest identity, of what we are called to be as God’s family. The most ambitious papal trek since 2002 in terms of its scheduling – and all but assured of being the most significant of 2015's planned PopeTrips in its levels of participation, intensity and fervor – Francis' weeklong journey in Southeast Asia ends Monday morning local time as his return flight for Rome departs at 9.45 (8.45pm ET Sunday).